If I was to describe SteamWorld Dig to someone who has never played it before, I would say it combines elements from Dig Dug, Metroid, and Mega Man. That’s a very interesting combination for one game. The thing I love about SteamWorld Dig is the freedom to explore anyway I choose. After being placed in a mining shaft filled with dirt, start digging and build your own shafts and tunnels. Build a great open chamber if you so desire. The choice is solely up to you. I really enjoy this freedom of exploration that developer Image & Form has crafted. SteamWorld Dig is a platformer with some unique puzzle mechanics. Image & Form did a great job on creating environment puzzles that interact with your skills and abilities. Each puzzle has a secret that you may or may not be able to access depending on the abilities that you’ve acquired before attempting the puzzle, which can be completed regardless of said abilities. You may be required to make a return visit once you’ve acquired the proper ability to solve the secrets, which is a feature I really liked. Usually I’m not fond of backtracking, but being able to complete the core puzzle mechanic and then return later for the secret made it feel as if it is my decision whether or not to go back. I really appreciate Image & Form giving the gamer a choice and hope other developers in the future take note when making a Metroidvania-syled game. The replayability of SteamWorld Dig is incredible. The game can be played in its entirety in a single afternoon. However, I really think the most value is going to be experienced by anyone who gets the 3DS version of the game, as it’s great to play in either in short bursts or long car trips. It is a game that can be picked up at any time. Returning to the game after you haven’t played it for a while isn’t an issue either. You can easily pick up where you left off without racking your brain about where you were or what you were attempting to do. 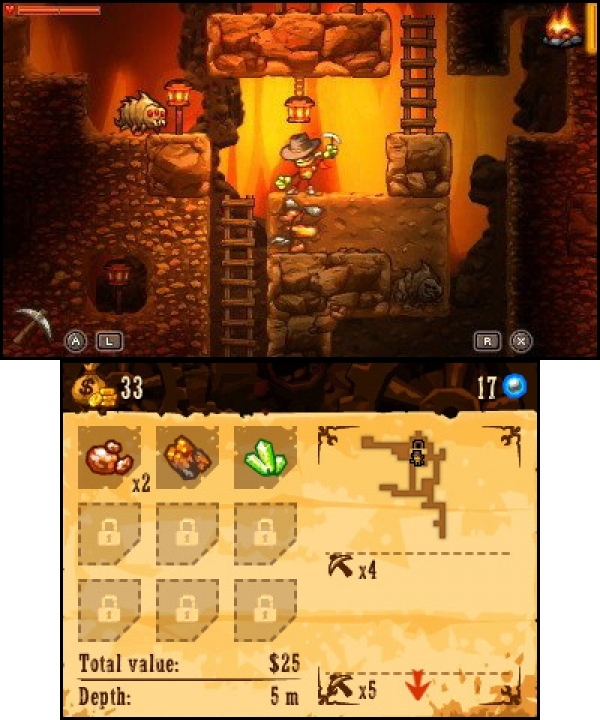 The biggest problem I’ve experienced with SteamWorld Dig is I constantly forget that if I dig out the dirt beneath a lantern, that I will destroy it. Light is very important in a deep dark mining shaft for obvious reasons. I constantly find myself going back to the surface to purchase a new light source to replace the one I’ve just destroyed. I get so caught up into digging that I just become oblivious to everything except the map I am attempting to create. I also find myself getting sidetracked and building massive chambers. I feel like I’m creating a maze of catacombs that someone other than myself will one day explore. I’m the only person that will ever see my catacombs, but that doesn’t stop me from creating these complex chambers. 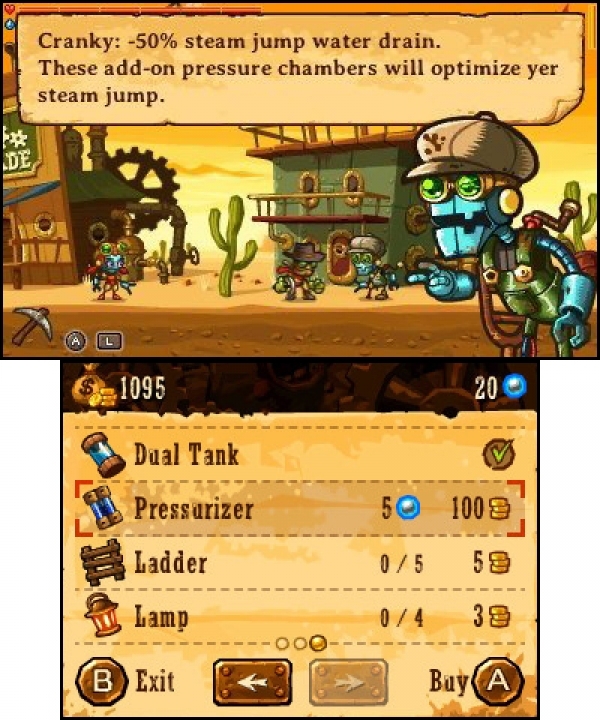 No matter how many times you choose to replay SteamWorld Dig, the opening game mechanics are slow and constant. 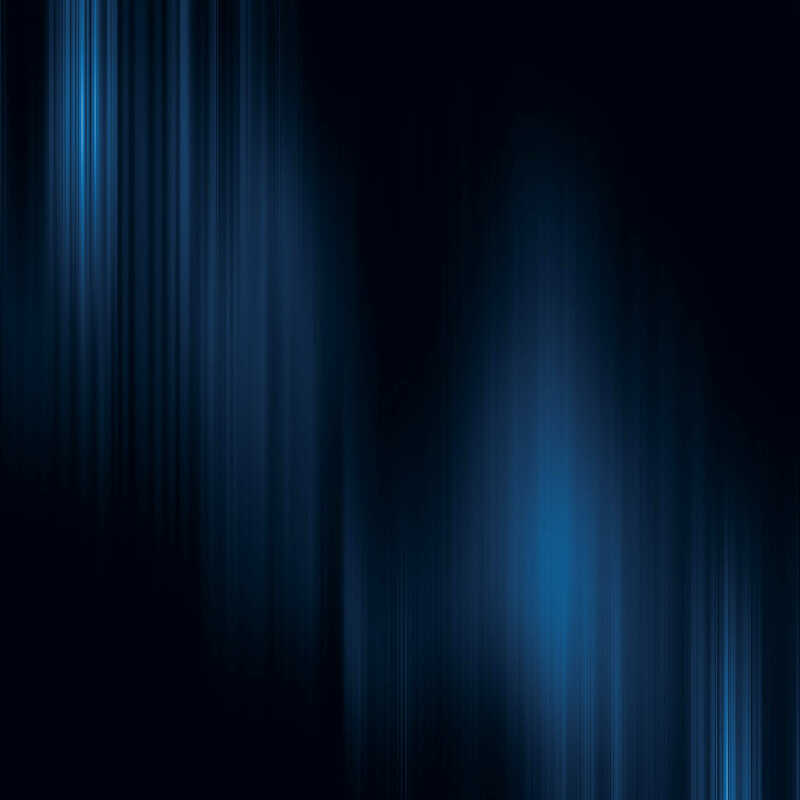 In the beginning, you will have to make repeated trips to the surface to restore your light and sell precious gems you’ve acquired in your bag with rather limited space. The game doesn’t really pick up until teleporters are installed. I kind of wish there was a new game+ mode that allowed me to keep my inventory space and light source from my previous game. The beginning isn’t bad; it’s just slow, so be prepared for that. 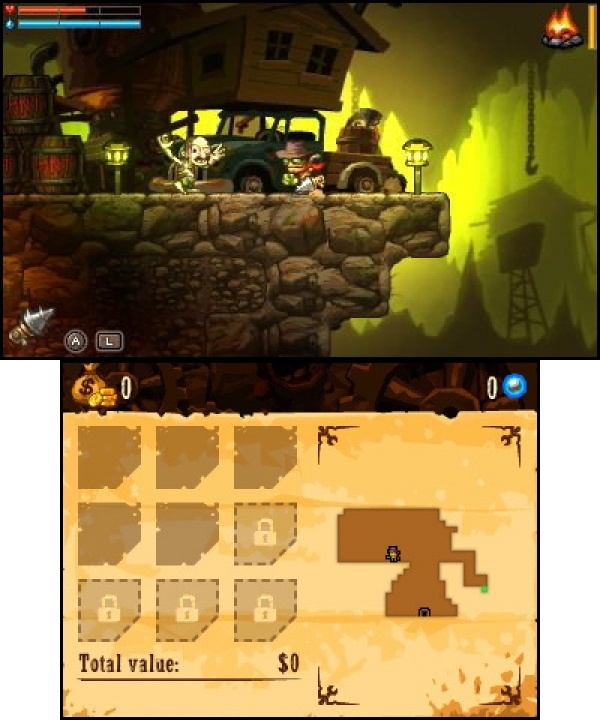 SteamWorld Dig is available on multiple platforms–Nintendo Wii U, 3DS, Steam, PlayStation 4, and Vita. I personally own it for the Wii U, 3DS, and Steam. That’s a testament to how good a game is, when one is willing to purchase it for multiple platforms. Check the price for the platform of your preference. I’ve found the pricing is reasonable regardless of platform. I don’t think it warrants waiting for a sale. However, it’s your money; buy it at the price that’s right for you. This entry was posted in Handhelds, Post, Reviews, Wii U and tagged 3DS, Image & Form, indie, nintendo, Saint Killjoy, SteamWorld, SteamWorld Dig, Travis Patterson, wii u. Bookmark the permalink.